Why Are There No Famous Financial Whistleblowers in This Crisis? This column discusses one of the more subtle issues raised by the Department of Justice’s (DOJ’s) civil fraud action against Bank of America (B of A). The issue was so subtle that of the three articles about the lawsuit that I choose to review the night after the suit was filed, only the NYT article mentioned one of the most important aspects of the suit – the key role that the whistleblower played in making the action possible. The AP and the WSJ articles ignored the fact. This is the first major action relating to the frauds that caused the crisis that the government has brought that is based principally on a whistle-blowers’s revelations. This is not simply worth mentioning, it is the most important aspect of the lawsuit. Indeed, as one can see on the face of the complaint, DOJ is “intervening” in a civil action brought by O’Donnell under the False Claims Act because its investigation has confirmed that his claims are meritorious and DOJ wishes to take the lead in the litigation. Here are some of the essential discussions that the whistle-blower’s disclosures and DOJ’s continuing refusal to investigate (criminally) and prosecute the elite frauds should prompt. Banks will rarely make criminal referrals against their CEOs. We have fewer than two FBI white-collar agents per industry, so the FBI agents do not patrol a beat. They have to wait until they receive a criminal referral to know what they should investigate. Whistle-blowers can provide those referrals and when they do so the referrals are of immense value because of their insider perspective and because they can provide the FBI with the ability to investigate the frauds before they fail. This can massively reduce damages and allow far more effective investigative techniques. There have been a significant number of whistle-blowers during this crisis, but none has become famous. The Bush and the Obama administrations have failed to praise and make famous as an exemplar anyone who fought within the lenders to stop their endemic frauds. In the DOJ press release announcing the civil suit, U.S. Attorney Preet Bharara (SDNY) did not even mention O’Donnell’s name, did not note that a whistle-blower had made the suit possible, offered no thanks to O’Donnell, and made no call for others to come forward and alert DOJ to other control frauds. The press release consists of statements by three federal officials praising – federal officials. Full Spectrum Lending’s senior management was repeatedly warned that eliminating toll gates for quality control and fraud prevention, and expanding the authority of loan processors and compensating them based on volume without regard to quality, would yield disastrous results. For example, in January 2008, a pre-funding quality review showed an overall defect rate of 57%, and a defect rate of nearly 70% for stated income loans. Full Spectrum Lending senior management, however, made no changes to the Hustle, and instead restricted dissemination of the pre-funding review. Paragraphs 67-71 are the centerpiece of the Complaint. 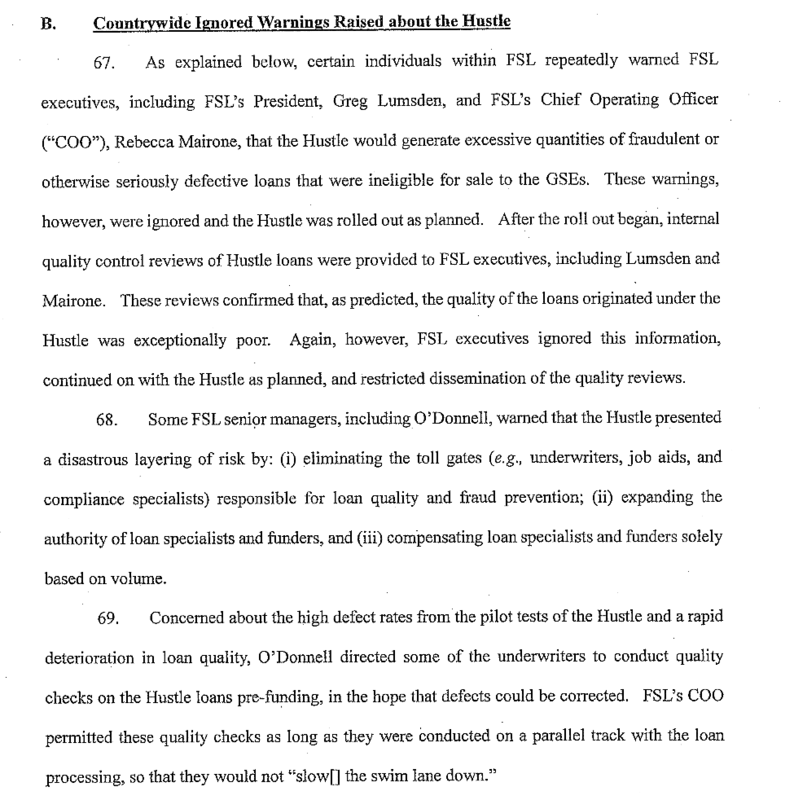 They show that O’Donnell played the key role in trying to prevent the fraud through these studies and warnings. Bharara’s failure in the press conference to praise O’Donnell’s actions and ask others to come forward is revealing. 8. The NYT story presented O’Donnell in a dismissive and negative light that would be inappropriate for any straight news story and was bizarre given the strongly positive facts that the reporter would have learned about O’Donnell by reviewing the centerpiece of the Complaint. Here again are the key passages. The act also provides an avenue for a Countrywide whistle-blower, Edward J. O’Donnell, to cash in. Under the [False Claims] act, the government can piggyback on accusations he filed in a lawsuit that was kept under seal until now. What makes the immediate sliming of O’Donnell so revealing is that it was clearly instinctive. The NYT piece had to be written extremely quickly and the author does not indicate that he tried to interview O’Donnell. The U.S. public probably exhibits less hostility towards whistle-blowers than nearly all nations, but our instinctive reaction is still typically negative. The finance community’s view of whistle-blowers is that Gitmo would be too good for them. Financial reporters swim ceaselessly in this cesspool and hear endless complaints from financial elites (who are incapable of introspection and irony) that whistle-blowers are greedy and the scum of the earth. Financial CEOs led the unholy war against adoption of the whistle-blower provisions of the Dodd-Frank Act. Once the Act became law their principal goal became perverting the SEC rules implementing the provision to deny any financial reward to whistle-blowers unless they alert the firm before they alert the SEC to the senior officers’ fraud. That prior warning would allow fraudulent senior officers to coerce the whistle-blower to try to prevent him from alerting the SEC, allow the officers to cover up the evidence of the fraud, and alert the officers so that they would not make any admissions that might be overheard by the whistle-blower or through electronic surveillance. Both Republican SEC Commissioners voted against the rule because it rejected the industry’s demand for a rule requiring the whistle-blower to first alert the senior officers that he had discovered their frauds. That effort to pervert the Dodd-Frank whistle-blower provision into a rule that would aid elite frauds will succeed if the Governor Romney wins the election. The fact that the business community fought ferociously against doing anything to encourage whistle-blowers is an example of what we call “revealed preferences” in economics. Honest CEOs should encourage whistle-blowers. CEOs often say that they encourage whistle-blowers. Their SEC filings reveal their true beliefs. We have far too few whistle-blowers and because of the worst epidemic of accounting control fraud in history and the death of criminal referrals by the banking regulatory agencies our need for whistle-blowers has never been greater. Indeed, our federal prosecutors are the people who most desperately need to encourage whistle-blowers to come forward who worked at the financial control frauds. Given that desperate need how would a rational administration respond? The President and the Attorney General would hold a press conference with a group of whistle-blowers. He would praise their performance, give a few specifics of how valuable the information they provided was to the nation, urge the tens of thousands of Americans who have information about other frauds to come forward, provide a web site for future whistle-blowers to use, and help arrange a publicity tour in which the select group of whistle-blowers appeared on a series of major television and radio programs where their efforts could be extolled and they could ask others to follow their lead. The DOJ web site would extoll whistle-blowing and give examples of how their actions helped the nation. It would showcase video interviews with whistle-blowers that could be picked up by You Tube. The DOJ would hold rallies outside buildings that had (or do) house the worst frauds featuring the whistle-blowers who had come forward and asking others to follow their lead. The President would host a White House dinner for the whistle-blowers and bestow a medal on some of the most praiseworthy. That is what an administration devoted to holding the elite frauds accountable would do. Instead, Presidents Bush and Obama and their Attorney Generals have ignored the whistle-blowers. They have never urged Americans to come forward with information on the elite frauds who became wealthy by driving the crisis. Bharara, in a PR piece he knew would be read by hundreds of reporters, did not thank O’Donnell and did not call upon Americans to come forward with information about the elite frauds. The Department of Justice once had as a major priority the prosecution of Financial Institution Fraud. Financial Institution Fraud (FIF) is an official DOJ category. 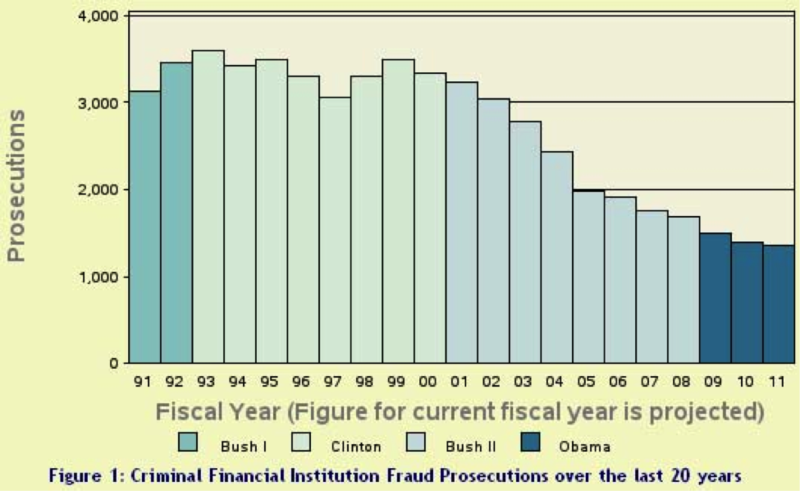 Here is a chart showing the prosecutorial record over time for FIF prepared by Syracuse University. Conservative economists (and “law and economics” scholars) have long embraced Gary Becker’s claim that the key to dealing with crime is deterrence through increasing the likelihood and severity of criminal sanctions. They should cite this chart. If one dramatically reduces the risk of prosecution of the most elite financial frauds the result is likely to be an enormous increase in elite financial institution fraud and a catastrophic financial crisis. We were told by Obama and Holder that they created the Task Force to reverse the disaster displayed in Figure 1. So we can doubtless turn to the list on the Task Force’s web site where the public can report frauds for the category “Financial Institution Fraud.” Except that there is no category. Perhaps they feared that “Financial Institution Fraud” was too complex a term and might confuse potential whistle-blowers. “Bank Fraud” would probably be their choice if the designers of the web site were worried about confusing the public – it is a short and clear phrase. Except that there is no such category. There is also no general category labeled “other.” Whistle-blowers that wish to report fraudulent financial institutions need not bother to use the Task Force’s “report fraud” feature. It’s almost as if FIF prosecutions were not a priority of the Obama administration. A Great Recession and at least $12 trillion in losses apparently do not outweigh the lure of lobbying lucre. It is useless to report financial control frauds “to your local law enforcement office.” Try this thought experiment: you invent a time machine and travel back to Houston, Texas in 2000. You call the Houston Police Department to warn them that something terrible is happening at Enron and beg them to treat it as an emergency and send in a team of detectives to tear apart their books. You begin to tell the officer about Enron’s Special Purpose Vehicles (SPVs). If you are lucky, they will refer you to the FBI. The far more likely result is that they will decide you are crazy and hang up on you. What they will not do is investigate Enron’s fraudulent accounting. This post was originally published at New Economic Perspectives and is reproduced here with permission. 5 Responses to "Why Are There No Famous Financial Whistleblowers in This Crisis?" Mr. Black hits the nail squarely on the head. Whistleblowers are treated like the proverbial skunk at the picnic (thank you Senator Grassley). And it is not just the economic arena. Whistleblowers in the government (and specifically the intelligence agencies) are treated like criminals. Enemies of the State, traitors, and snitches are terms used to describe Whistleblowers by our top government officials. But Whistleblowers have not backed down, because they possess a moral compass that forces them to move forward. That is why the National Whistleblowers Center has started a drive for a National Whistleblowers Day. Please join them, and Senator Grassley in honoring our national heroes, the Whistleblowers. Contact your representative, and ask that they participate in protecting and honoring Whistleblowers. Every one has so concentrated of Fannie & Freddie but have paid little attention to Ginnie Mae and the equal corruption by lenders/servicer but Ginnie Mae makes the crime happen. Ginnie Mae has run this Ponzi scheme since the beginning of its Mortgage Backed Securities (MBS) started, however it was not exposed until the record amount of foreclosures and bank seizures or mergers. Best example of the Ponzi is Washington Mutual Bank (WaMu) 1.3 million government insure loans Wells Fargo Bank is currently servicing. Wells Fargo enter into an agreement to service WaMu loans, in what appears to be a procedure to protect Ginnie Mae from a failure of the bank. Understand that Ginnie Mae works on a secret from the general public that they take in blank Notes under UCC 3 that once the Notes are transferred they are separated from the debt and title because without a financial interest in the Note the Note is of no value. A Note is a contract that an agree upon amount is to be paid back to the Lender that is listed on the Note. So as the Notes are endorse in BLANK there is no designated debt holder, and as it is a know fact of Ginnie Mae regulation through Congress the wholly government owned Ginnie Mae cannot originate, buy or sell a home mortgage because they are not allowed to create a debt for We the People! However Ginnie Mae created this monster to bring money into the mortgage market, which is really a way for "investors" who purchase the MBS to lend without the risk of being a mortgage loan lender, who do not take a lost of their principal investment. When you replace Ginnie Mae as the holder of the blank Notes you have invalidated the contracts, because the Notes are no longer held by a party that has a financial interest in the Notes, and there is no way to reunite the Notes with the debts, because Ginnie Mae never owns the debts. What Ginnie Mae end up with Notes that are non-negotiable documents that have exactly no value and cannot be executed because Ginnie Mae is not the "holder in due course" and cannot call a loan due because the not a single red cent due. Ginnie Mae at the local land recording office is not on title as the lien holder, and whoever was in title has no Note because it was relinquish to Ginnie Mae so there cannot be a valid claim because of the separation of Note, debt & title. Ginnie Mae along with MERS and in the case of WaMu loans tries to put together a chain of title claiming MERS has this un-broken link with its members. However WaMu once it relinquishes the Notes as with ever other transaction placed in the Ginnie Mae pools. WaMu was seized on Sept 25, 2008 and was declared a "failed bank" cover eliminated as to fake title holder. WaMu cannot act for itself and is no longer a bank and is not a member of MERS doing business as a bank and cannot have a surrogate (servicer) to act on its behalf. Ginnie Mae got around the fact that they were suppose to be in physical possession of the blank Notes in order to consummate the pooling agreement, however this leaves a void as no one can collect a single payment at all, because there not a valid lender! The FBI is not capable of understand the legal aspects of what going down because the only people in the world other than myself who understand this crap, works for Ginnie Mae and they are not talking because just with the HAMP foreclosures and the 800,000 should have been modified loans of the 4.4 million applications had a 20% government insured mortgage loans in the portfolio. Not a single government insured loan could have been foreclosed nor modified because there was no debt as Ginnie Mae did not possess title of! So we go on a average of $100,000 with a reported 10% insurance claim of the balances to the Federal Government FHA Mortgage Insurance Fund & VA Guaranty Fund. Bottomline is that we the People are owed from banks to include treble damages $24 billion. I express this to all the Federal agencies and have blown the whistle on this matter. Wells Fargo with WaMu loans and Bank of America with Countrywide loans, are perfect to show the impossibility in ownership of the Notes without an ability to reassign by Ginnie Mae yet the fraudulent foreclosures that occurred as a result of submitting fraudulent document to the courts which allows them to administratively foreclose by faking out the courts and defrauding the property owner out of their free and clear properties! Charles, I think I understand some of what you have written, but unfortunately your written english is a bit hard to follow. I don't really want to understand all of the technical details, but exactly what wa/is your role in the financial world? we share the same sentiments and inquiry provided the toxic mortgage back in 2008. I was looking for leads and names of those who have exploited the securitization procedures for debt.